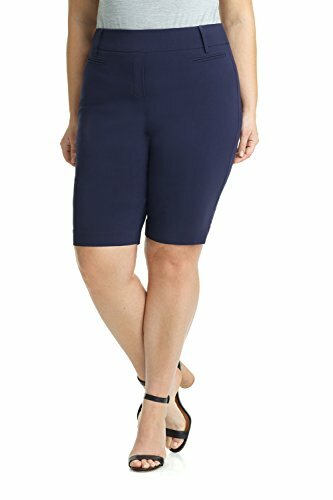 You will love our newest Rekucci "Ease In To Comfort" Curvy Fit Modern City Short. This pull-on style features our classic waistband with wide, flat 360 degree elastic. Additional hidden light front tummy control panel. Real front and back welt pockets, and belt loops make this style totally functional. This city short features a modest 12" inseam, and a small 1" slit on each leg. Introducing Curvy Fit by Rekucci, in sizes 14W - 24W. NEW! 360 DEGREE ELASTIC. 360 degree flat elastic waistband is wide, stretchy and hugs your body. We call it INFINITE COMFORT. FINALLY! SHORTS : Perfect length 12" inseam sits right above the knee and means you'll look great and feel great in our modern office short! Small 1" slit on each leg. Real Belt loops. ALL-DAY COMFORT: Pull-On Style. (No Zipper, Faux Front Fly). Hidden front soft tummy control panel. Model is 5'10" wearing size 14W.